When we started doing food reviews, I noticed that there’s a trend toward Insta-worthy food and restaurants. That’s alright in itself, but sometimes the taste doesn’t live up to expectations. Masarap lang picture-an, kumbaga. I realized that what I wanted to write about isn’t necessarily about the hip and trendy, but good food. Simply good food. Bad Bird, I believe, fits that category. I read about Bad Bird in another food blog and I’d been wanting to try it out. Unfortunately, they don’t have any branches in the south where we live. 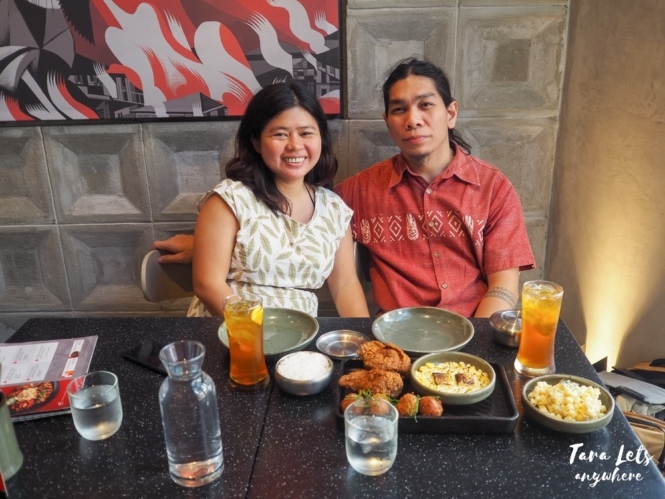 When we went to BGC for a long deserved staycation, we finally had a chance to drop by this fried chicken restaurant. 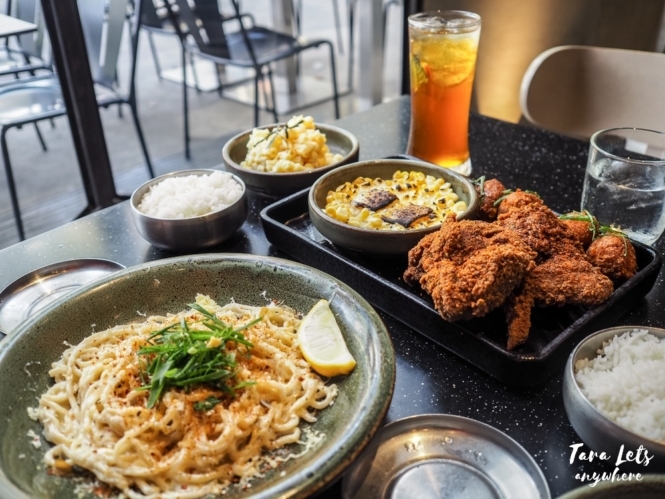 Bad Bird is a concept store from Low Brow Casual Restaurants, which have taken inspiration from the Japanese to create the ideal umami-flavored fried chicken. 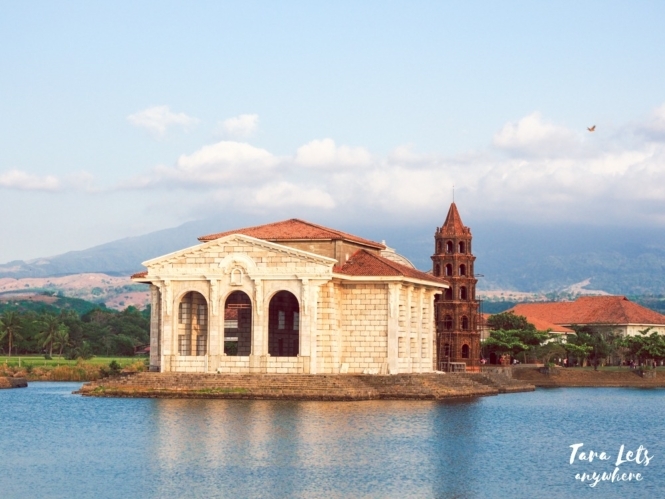 Their first branch was opened in Hole in the Wall, Century Mall, and now they have other branches in the metro. As of our visit (February 2019), Bad Bird has an on-going promo where you can choose a weekday set good for 2 people for only P499. 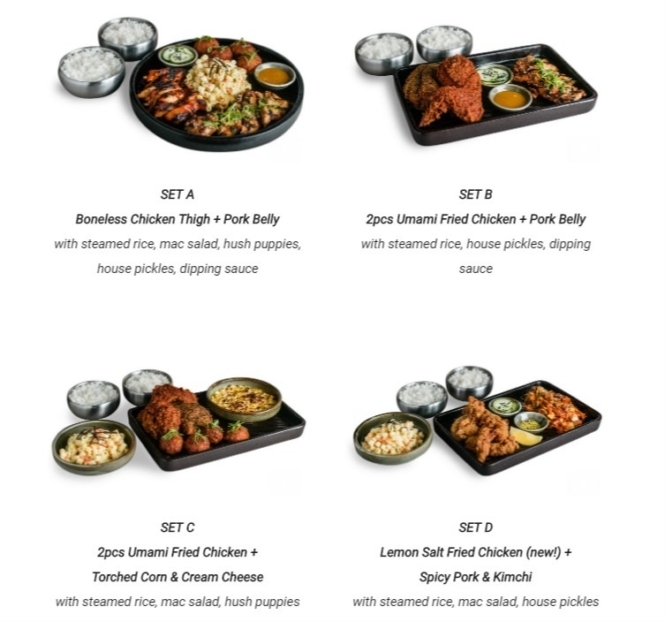 We chose Set C: 2 pieces umami fried chicken + torched corn and cream cheese (P499), which also includes steamed rice, mac salad and hush puppies. We had add-on home-brewed iced tea (P140). 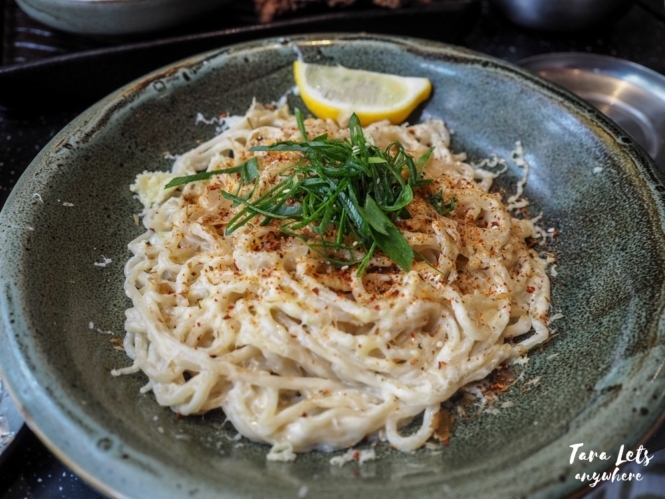 We also ordered a plate of four-cheese noodles (P280). Like I said, the star of this restaurant is their fried chicken, so let’s start off with that. 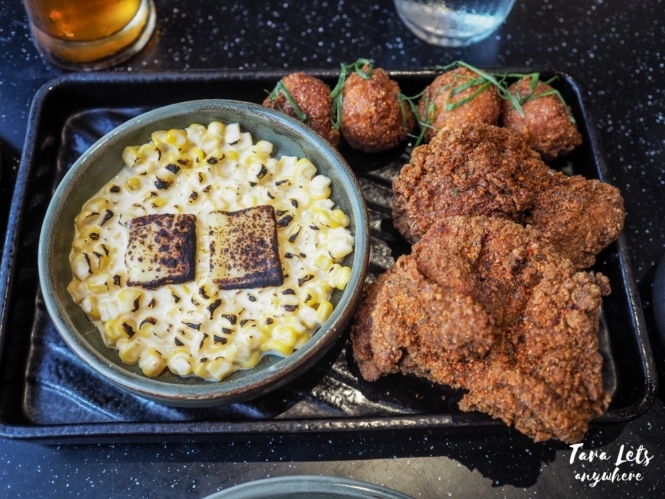 The fried chicken has a thick, flavorful breading. Online reviews were right, the chicken was so good. Each piece is also huge. It says on their website that their fried chicken is 20% bigger than other restaurants. The fried chicken comes in different flavor meters: Safe (non-spicy), Spicy and Chemical. The one we ordered is spicy, although as our server says, it’s only mildly spicy. I like it because it adds a little spice, but not so much that it distracts you from the flavor. 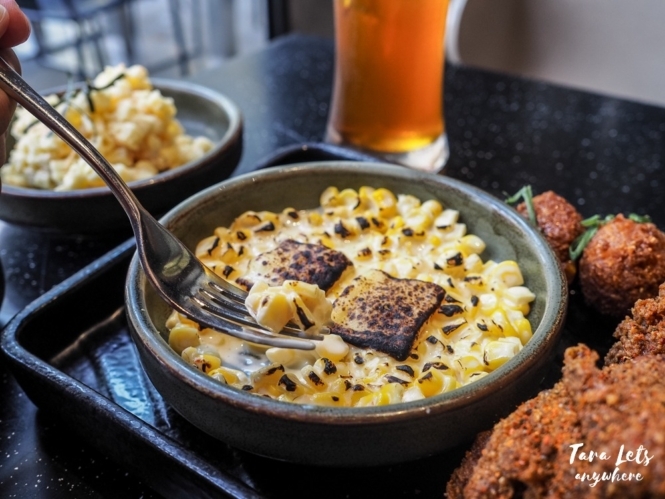 Weekday deal – set C.
As for the sides, the torched corn and cream cheese is amazing. I wish we had another plate of this. The mac salad is okay too, the nori strips (I think that’s what it is) add a nice, crispy touch. The hushpuppies (deep-fried balls made of cornmeal batter) are sweet and good as pantanggal-umay nibs. I’m not into sweets, but Hali finds it delicious and he finished all the hushpuppies served with our set. For the drinks, we liked the home-brewed iced tea as well. Actually, I usually just get service water because other drinks just add an unnecessary amount to the bill, but I can say that Bad Bird’s tea is worth it. The tea is delicious and refreshing. This is one of the few occasions wherein we ate at a restaurant and like all or most of what we ordered. I’m impressed with the quality of food in Bad Bird and I appreciate the generous servings, still within reasonable prices. Even without the added noodle dish, we were already full with the contents of Set C. Yes, we’d like to dine in here again sometime in the future and try out the rest of their bestsellers. 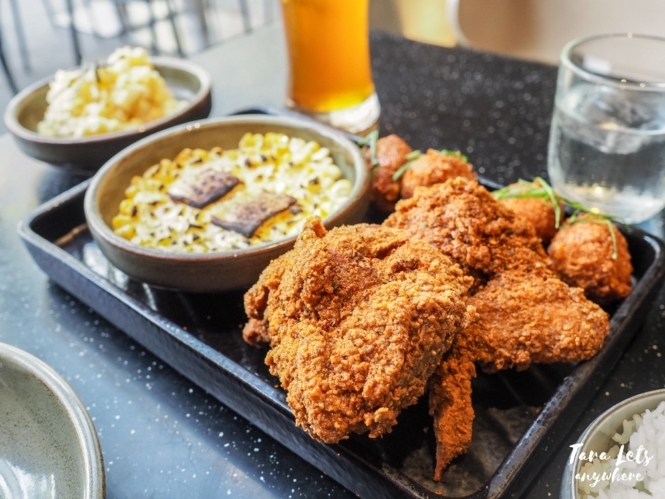 Bad Bird is a restaurant offering their own version of award-winning umami fried chicken. Have you tried eating at Bad Bird? What was your experience?